Official artwork of the Helirin from Kururin Squash!. The Helirin (ヘリリン, Helirin) is a machine with long rotor blades that appears in the game Kuru Kuru Kururin. It appears as a trophy in Super Smash Bros. Melee and an Assist Trophy in Super Smash Bros. Brawl. Official artwork of Kururin riding the Helirin from Kururin Squash! The Helirin first appeared in Kuru Kuru Kururin. In Kuru Kuru Kururin, the player controls a thin helicopter that has slow moving propellers. Each level involves maneuvering through a maze without hitting the propellers against a wall. If the propellers hit a wall, it gets damaged. When the propeller hits the wall three times, a life is lost. The Helirin also appears in the GameCube game Kururin Squash and is the first game where the Helirin is rendered in 3D. The Helirin appears as a collectable trophy in Melee. Due to a translation error, its name is mistakenly spelt "Heririn" in the North American release of the game; the later PAL version rectified this error. The Helirin trophy in Melee. Kururin sets off in his specialized helicopter to rescue his siblings who have lost their way somewhere among ten worlds. The helicopter is fitted with an enormous blade, which propels the machine forward by slowly rotating. The mazes that Kururin must navigate are narrow and filled with all kinds of strange obstacles. The Helirin being used as a platform. In Brawl, the Helirin appears as an Assist Trophy. When summoned, the Helirin will fly slowly to a certain part of the stage. 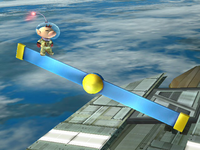 The characters can stand on the Helirin and use it as a moving platform. Helirin is a solid platform, so characters, including the one who summons Helirin, cannot pass through it. It stays out for a rather short length of time, rotating slowly all the while. This platform can make Thunder act in strange ways if the move hits at a certain angle. The Helirin trophy in Brawl. A unique helicopter that flies with long, slowly rotating wings. If the wings strike walls or obstacles, the Helirin takes damage and loses hearts. The wings normally spin clockwise, but the rotation can be reversed by touching springs. There are many areas that require this technique. The Helirin can be customized by picking up and using a variety of items. Official artwork of the Helirin in Brawl. Helirin is the only Assist Trophy in the series, current or former, whose Spirit in Ultimate is of the Novice class. Helirin can push characters down through hard platforms. This page was last edited on February 18, 2019, at 04:10.